Justice Funders is a partner and guide for philanthropy in reimagining practices that advance a thriving and just world. We envision a world that honors the sacredness of our natural resources and recognizes the inalienable rights of all. We assert that philanthropy must take an active role in building this world by redistributing all aspects of well-being, democratizing power and shifting economic control to communities. Redistribution requires us to reject the accumulation of wealth and power, which drives economic inequality. It means letting go of two narratives that currently dominate philanthropy: 1) charity, which perpetuates power dynamics between givers and receivers without tackling root causes of injustice; and 2) investment, which expects a financial return to the ultimate benefit of the investor. By embracing redistribution, we are following the lead of the most courageous movement leaders of our time, who are standing in their power and unapologetically asserting their rights to live with dignity and to thrive. We are deeply inspired by this movement moment and recognize that now – more than ever – philanthropy must be just as bold and relentless. What this means for philanthropy is that, rather than accumulating wealth and power, we must use it to resource movements that fight the systems that oppress us and also support the creation of new, local, resilient economies that build wealth in low-income communities and communities of color. We are guided by the Just Transition principles for building political and economic power to shift from an extractive economy to a regenerative economy. As such, a Just Transition for philanthropy requires philanthropic institutions to shift their practices away from extraction towards regeneration, which requires fundamentally shifting our underlying assumptions about capital and our underlying approach to philanthropy. Justice Funder’s 100-year vision for a Just Transition for philanthropy is detailed in Resonance: A Framework for Philanthropic Transformation. At Justice Funders, we are re-imagining a world that works for all of us, and philanthropy’s role in creating it. Justice Funders emerged in 2009 as the Bay Area Justice Funders Network, as local funders sought spaces to bring the philanthropic community together with front-line leaders following the murder of Oscar Grant by BART Police. 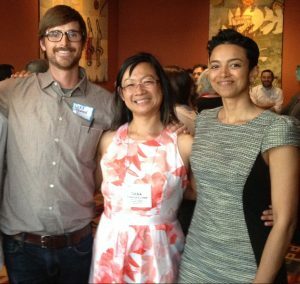 Melanie Cervantes (Akonadi Foundation), Luke Newton (Common Counsel Foundation), Vanessa Daniel (Groundswell Fund), Carmen Rojas (Mitchell Kapor Foundation), and Kazu Haga (Peace Development Fund) formed the founding steering committee, which solidified the goals for the network, raised seed monies, and hired staff. Over the next seven years, our work began to broaden in scope and reach beyond the local network. After having tested and incubated successful interventions to re-imagine philanthropic practices, the organization adopted a new name to reflect its expansion. Today, Justice Funders is the home of Bay Area Justice Funders Network while also 1) offering professional and leadership development programs, 2) providing coaching and consulting for organizational transformation; and 3) designing, piloting and scaling innovative collaborations that advance social justice movements. By engaging in these multiple areas of programming, Justice Funders is ushering a Just Transition within the field of philanthropy to take a proactive role in building the world we need.